The Fremont Tour, is not a boring lecture. It is very interactive. During our walking tour we will participate in an ART ATTACK, fire the 47’ Fremont Rocket and meet the Fremont Troll’s cousin. As a street theater, our tour guides dress in a costume (The Fremont Fairy Godmother, J-efe the Turkish Rap Singer etc.) and tell the story of our public art in a character. We have props and costumes and playfully involve strangers in the street who have NO IDEA they are going to be a part of our story. This makes each walking tour fun and unique. Our mission statement is - To encourage people to find their playfulness through art and history!! And this is what happens!! Our walking tour is a half-mile long and takes about 90 minutes. Strollers are fine and the tour is wheelchair accessible, but we do walk up and down one steep hill. Dress appropriately for the weather.The walking tour goes on rain or shine – a Seattle tradition. The walking tour has limited space, so advance reservations are highly recommended. The Fremont District is located 4 miles north of Seattle's downtown core. It is easily accessible by taxi or city buses (#05, 26, 28, 30, 31, 40). There is off street parking right across from Solstice Plaza. 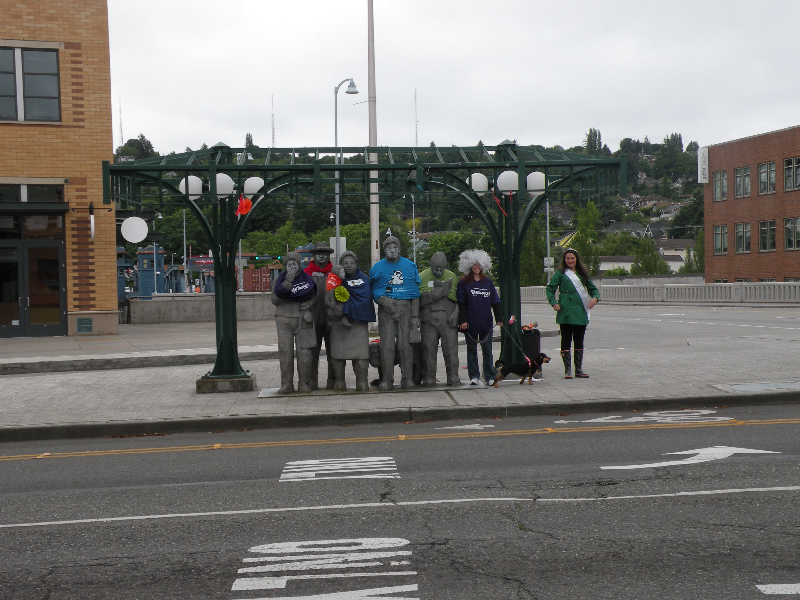 Our walking tour begins at Solstice Plaza - 711 N. 34th Street, Seattle, WA 98103. This is the sunken plaza along N. 34th Street at the Quadrant Lake Union Center. We continue to offer special group tours year round. Email for info. Our 2018 regular tour schedule will begin in June but you can purchase tickets as early as January 1st, 2018. Thanks for your time and interest. We have different pricing for group tours. If you're interested in a tour scheduled especially for your group, you can read more here or contact us for more information.